Do any propellers/propfans use stator vanes? Why is this not a commonplace feature? I understand that axial-flow turbine engines generally include stator vanes behind every(?) compressor and turbine stage. This makes quite intuitively sense, because without them the rotating blades would mostly swirl the air around through the engine, which would not only prevent the stages from properly transporting/compressing/expanding the air in axial direction, but also put useless rotational kinetic energy into that air. The latter is presumably also the reason why turbofans have such guide vanes behind the fan, too. All of this applies just as well to unducted fans/propellers. Yet I've never seen stator blades behind an open propeller. There are contra-rotating coaxial propellers of course, the idea of which seems to be similar: get rid of the useless solenoidal air motion. But actively contra-rotating both props adds a lot of complexity, and seems somewhat unnecessary if the goal is mostly to remove large part of the swirling motion. Cancelling all torque is not necessary for a plane. Especially, I would think stators could also be shaped to help retrieve some energy from the tip vortices like a duct does, without however interfering with the inflow that seems to be the reason why ducts make props inefficient at low speed. Presents the flow at the correct angle for the next rotor stage. A nozzle guide vanes stage (what a turbine stator stage likes to be called) comes before the turbine stage, and it does the same but in reverse (turns pressure into velocity) and adjusts the flow direction for the upcoming turbine stage. 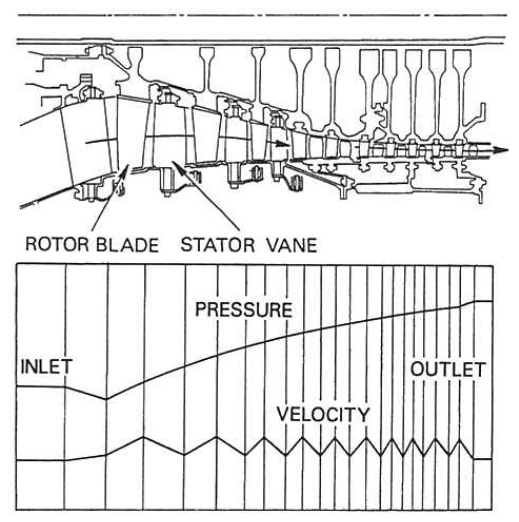 The de-swirl function of the stator stage behind a fan in a turbofan (the outlet guide vanes – OGVs) is beneficial because of how much air the fan has acted on. This is where a turbofan's OGVs become beneficial. Adding a static stage of blades behind a propeller (with or without a case) that doesn't accelerate the air by that much to recover meaningful pressure (compared to a turbofan's fan, not much kinetic energy to begin with) in the axial direction won't help. On the contrary it will add drag (air hitting a static object), and weight. Actively contra-rotating both props adds a lot of complexity, and seems somewhat unnecessary if the goal is mostly to remove large part of the swirling motion. Cancelling all torque is not necessary for a plane. A propeller is like a wing, it needs to act on (hit) air to create a normal force. If we substitute the second set of moving prop blades with static ones, we've just lost a lot of thrust. Quick answer is that it boils down to thrust vs drag. Propellers create thrust as airfoils and mass movers, fans are less efficient mass movers that can move much more mass if sufficient power is available. This is why fans are teamed with jet engines. Brute force. A stator will not benefit the more efficient propeller, but I would not wish to discourage research. The "reason ducts make props" link provided above is outstanding in that it shows each more efficient propulsion method falling by the wayside as speed increases due to drag, while the turbojet keeps improving. Not the answer you're looking for? Browse other questions tagged propeller turbofan compressor or ask your own question. Why don't drones use ducted fans? In a turbofan, why are there no stators behind the fan? Why does this calculation show Gustave Whitehead's propellers were more than 100% efficient? Do propellers have any lead/lag mechanism? Why do these tail-sitters not have bigger propellers in their main engine? Why don't contra-rotating propeller configurations with more than two propellers exist? What's the use of so much torque on propellers? Why use jet engines instead of propellers when designing new airplanes? Why do compressors constrict flow if this decreases pressure?